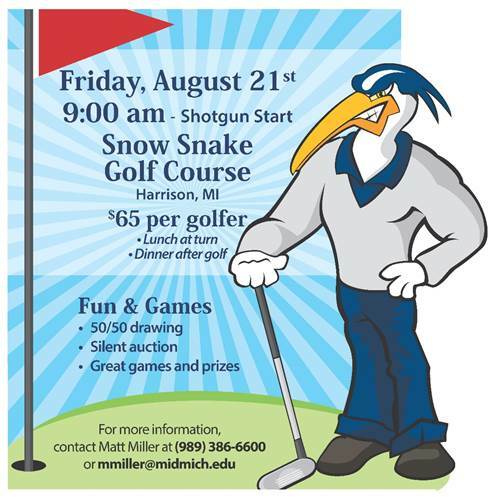 The Mid Michigan Community College Lakers Golf Outing is Aug. 21 at Snow Snake Golf Course in Harrison. Registration is now open for this event, which provides a fun day of golf to support the MMCC men’s and women’s basketball teams and the hockey club. The $65 fee includes lunch at the turn and dinner after golf. You also can support the MMCC Lakers with a sponsorship or donation. Visit www.midmich.edu/athletics for more information about registration and sponsorships or contact Matt Miller with questions at mmiller@midmich.edu.